"Operators are special symbols that perform specific operations on one, two, or three operands, and then return a result"
In other words, the operations you do with the variables in your Java Program are represented by some signs. They are called Operators. For example, Assignment Operator (=). We use it for assigning some value in a variable. 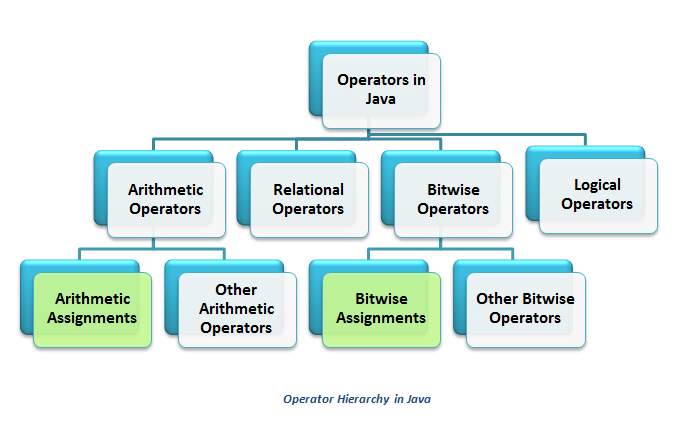 Java provides many other operators. We can divide them according to their categories. We will discuss about all these operators one by one. 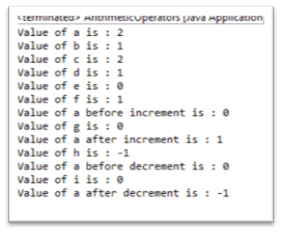 Though most of the operators are common in Arithmetic, Increment and Decrement operators are not. Increment or decrement operators are used mainly in 2 ways. Either we can use it before the variable (++a) or after the variable (a++). This statement means, first increment the variable by 1(i.e. a=a+1). i.e. Make an increment of the variable by 1(i.e. a=a+1). Similar applies for decrement operator. Arithmetic Assignment Operators are quite straight forward and self-explanatory too!